The goal of The Fellowship of the Inexhaustible Cup is to provide and establish a network of intercessory prayer and support among its members in order to combat the many destructive forces of addictions present in our day and age. The caring members of the Fellowship of the Inexhaustible Cup have the primary purpose of honoring Our Most Holy Lady, the Theotokos, as the Fellowship’s Champion Leader by acquiring and maintaining quality sobriety and purity as a way of life. The Fellowship’s foundation is based on prayer to the Holy Icon of Our Lady of the Inexhaustible Cup. Our group is patterned after a similar society which arose shortly after the Icon’s initial miracle-working abilities were discovered in 1878, in Russia. Fr. Christophe Lepoutre is a highly trained pastoral counselor/Orthodox Psychotherapist specializing in the treatment of all manner of addictions for many years. He offers to members evaluation, diagnostic/treatment plans including individual, marriage and family pastoral counseling. In-depth counseling is available on a sliding scale/contribution basis. The caring members of the Fellowship of the Inexhaustible Cup have the primary purpose of honoring Our Most Holy Lady, the Theotokos, as the Fellowship’s Champion Leader by acquiring and maintaining quality sobriety and purity as a way of life. Members are committed to praying all or part of the Akathist of the Inexhaustible Cup on a daily basis, as well as making a monthly financial commitment to help sustain the work of the Fellowship. Members are devoted to praying for and reaching out to those suffering from all manner of addictions, helping the afflicted at their point of need, and ringing them the message of hope and healing. Our Lady of the Inexhaustible Cup invites all of its members to come under her Omophorion and receive her holy protection, intercession, and assistance. She promises to make a very important commitment to us which can be found in the Akathist to the Mother of God, The Inexhaustible Cup. Our Lady of the Inexhaustible Cup offers her precious child Jesus inside the Holy Mystery of Communion as a means and an end to the healing of every known addiction and its destructive influence. She also makes clear to all who pray the Akathist to the Inexhaustible Cup that she herself is the Holy Chalice which contains His most precious body and blood. Thank you for your prayerful participation and consideration. Fr. 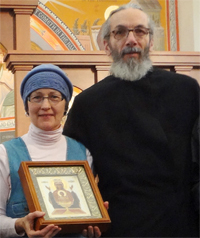 Christophe Lepoutre, M.S., Pastoral Counseling, and his wife, Matushka Cynthia.